Good news, everybody! The Didactic SynCast is back! After months of silence, my podcast is online once again. And what a time to return — I scored an interview with the amazing writer and activist Sarah Schulman, author of the new novel The Cosmopolitans, based on Honoré de Balzac’s La Cousine Bette. Have a listen and subscribe to the new iTunes feed. 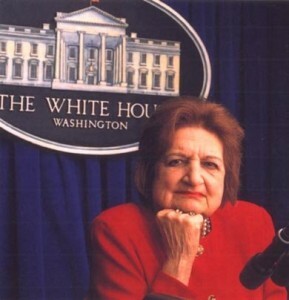 Journalist Helen Thomas died today. She was a remarkable pioneer for women in journalism, but she was also a vital voice of dissent and a relentless practitioner of aggressive, fearless reporting. She had the courage to ask tough questions, and she did not accept political doublespeak. She did not — as so many do these days — simply write down the talking points of both sides of a political divide, and tell the reader: “Now you figure it out.” Instead, she pursued the truth and reported it as best she could. She was persistent to the point of badgering. One White House press secretary described her questioning as “torture” — and he was one of her fans. And now a word to the Jews in Palestine. I have no doubt that they are going about it in the wrong way. The Palestine of the Biblical conception is not a geographical tract. It is in their hearts. But if they must look to the Palestine of geography as their national home, it is wrong to enter it under the shadow of the British gun. A religious act cannot be performed with the aid of the bayonet or the bomb. They can settle in Palestine only by the goodwill of the Arabs. Finally, however, I wish to stress once more that we resist the temptation to make a person’s least agreeable moment the totality of that person’s identity. However you might feel about that last public episode, we owe Ms. Thomas a significant debt of gratitude for her indefatigable work in the name of democracy, justice, and peace. EDIT: I totally forgot about her awesome video with Colbert! Thanks, Reddit. I finally did a new episode. You’re welcome. Listen to me talk about Obama’s re-election (just a little), Hurricane Sandy, Israel and Gaza, and some other stuff. North Carolina teacher: I quit. Was Hurricane Sandy Caused by Global Warming? What really happens when a city makes its transit system free?